The Nicholas Bohr Barn/ Staudenmaeir Barn was constructed in 1879 and is located in Troy. 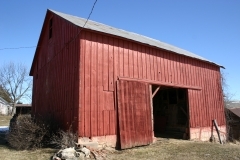 It is an example of a three-bay barn with a central entrance, partial byre, board-and-batten siding, a gable roof, and a limestone foundation. This barn was nominated as one of the 18 Byre and Bluff barns of Doniphan County. A common feature of these barns is that at least one side of the foundation is embedded in an earthen bank or bluff. These barns are an example of vernacular architecture built to take advantage of the hilly topography and are significant for their relative rarity and architecture.